Music lovers know that the Haffner Symphony K 385 is one of Mozart’s masterpieces: Theresia Youth Orchestra has recently introduced it in its repertoire and will perform it on 8th and 9th June as a part of the opening of Risonanze Festival, together with music by Joseph Martin Kraus. So, our musicians are justifiably thrilled, and we are too. But, what do we know about Haffner Symphony? And what does “Haffner” mean? First of all, Haffner is the name of a prominent family of Salzburg: Sigmund Haffner der Elder, born in 1699, had been mayor of Salzburg and had helped out the Mozarts on their early tours of Europe. The elder Haffner died in 1772, but the families remained in contact. In 1776, his son, Sigmund Haffner the Younger (a Mozart’s childhood friend, born in the very same year) commissioned a Serenade for the wedding of his sister Marie Elizabeth. This work became the famous Haffner Serenade K 250 in eight movements, which was so successful that, when the younger Sigmund Haffner was to be ennobled, it was only natural that Mozart was called upon to write the music for the occasion. Actually, the call came via Mozart’s father on 20 July 1782, in a moment when Mozart had anything but spare time: “I am up to my eyes in work”, he wrote to his father. Among the other things, he had to rearrange the score of his opera “Die Entführung aus dem Serail” before July 28, and a number of complications were threatening his proposed marriage to Constanze Weber. Nevertheless, managed to work on the music, and sent it through section by section to his father. 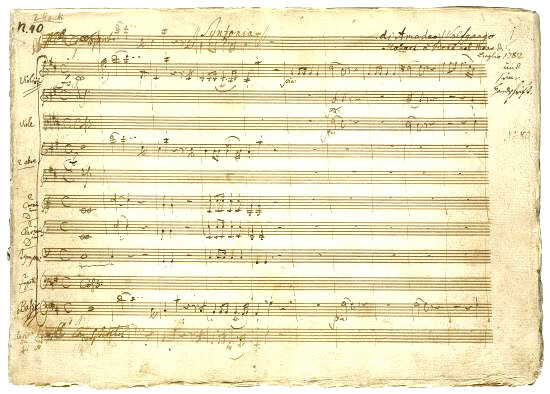 What Mozart wrote at this time was a new serenade – a completely different work from the serenade presented four years earlier – with an introductory March and two Minuets. The Haffner is a Symphony of immense variety and drama, crackling energy, and tireless invention. From the very first measures, with their urgent call to attention, the symphony is serious business — far too ambitious to serve as background music for even the most important social event. The entire first movement is permeated by leaping octaves and dashing rhythms. The Andante and Minuet that follow seem at first glance like a flashback to courtly Salzburg. But in both of these movements — one all elegant manners and grace, the other all formality — Mozart gets everything right, down to the tiniest of details, raising period pieces to art. The bustling finale is an exercise in speed and precision (Mozart said it should “go as fast as possible”). Theresia Youth Orchestra will perform the Haffner Symphony together with Mozart’s Ouverture from “Le Nozze di Figaro” KV 492 and Kraus’ Symphony in c minor VB 142 and Chaconne from “Aeneas i Cartago” VB 23 on 8th June in Malborghetto and on 9th June in Udine. Further information on the Festival Risonanze website.